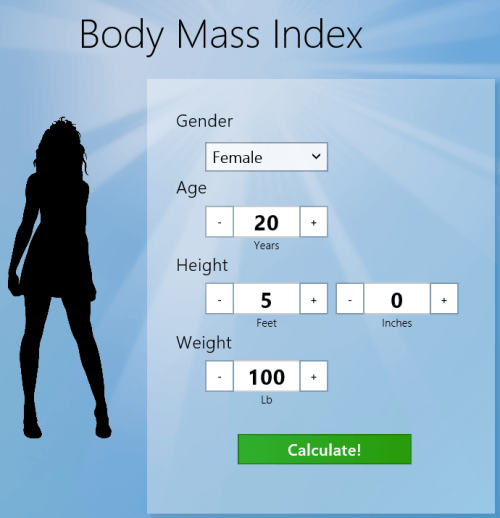 Windows 8 BMI Calculator App lets you calculate your body mass index. It is considered if the BMI (Body mass index) is within range of 18.5 to 25, then the overall health of person will also be good. If not then the person is either moving towards malnutrition or obesity. In more clear words, as person having BMI less than 18.5 needs to weight gain and the one having BMI above 25 requires loosing fat/weight. BMI Calculator Windows 8 App allows you to easily find your BMI within seconds without having to perform any calculation by yourself. All you need is to launch the app and you will be provided with following interface in front of you. Yep! you require filling the following form with 4 entries. Select your gender form the dropdown list, enter your age, height, and weight. If you are a bit confused about the units then right-click on the screen and a horizontal bar will emerge with a button in left corner. Now, click on it for switching LB/feet to metric system and vice-versa. Next, you require to click on ‘Calculate!’ button. In no time you will be provided with BMI report. * If the pointer is not on the green section of bar then it’s a problem. Larger the difference, bigger the problem will be. * Windows 8 BMI Calculator App is good, but it cannot replace a doctor. Once you have calculated your BMI, it will be nice to consult a qualified doctor. Also, there are a few medical conditions where your BMI might appear normal despite of bad health. Also, check out our posts on Calorie Tracker Apps, Home Remedies Apps, and Recipe Apps. To install Windows 8 BMI Calculator App you will require opening this link in supported browser like IE 10 or later. Then click on ‘View in Windows store’ to visit app overview page. 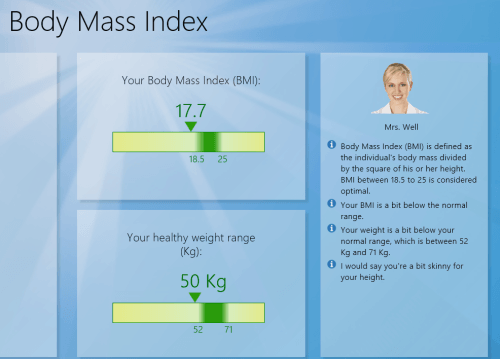 Windows 8 BMI Calculator App is likely to impress any health conscious person. It’s time for you to try it. You can also use this simple app for finding the BMI of your friends & family and take corrective measures to improve their fitness level. Go ahead and download BMI calculator app for Windows 8 now.